Are you sidelined because of an injury? Here’s your guide to physical therapy treatments that will help you get moving again. Going, going, going, ouch! Having to stop running because of an overuse injury is a serious buzzkill. The good news is physical therapy can help identify the source of the problem, get it fixed and prevent future aches and pains. But with a plethora of different techniques and approaches to therapy, how do you know what’s right for you? Here are some of the methods for addressing the most common running injuries to help you identify what your injury might require. Most runners will benefit from treatment done with the hands, says Clare Safran-Norton, a physical therapist at Brigham and Women’s Hospital in Boston. This could include applying pressure to a joint to move it into a correct position, stretching tight muscles, strengthening weak areas and massaging painful ones. 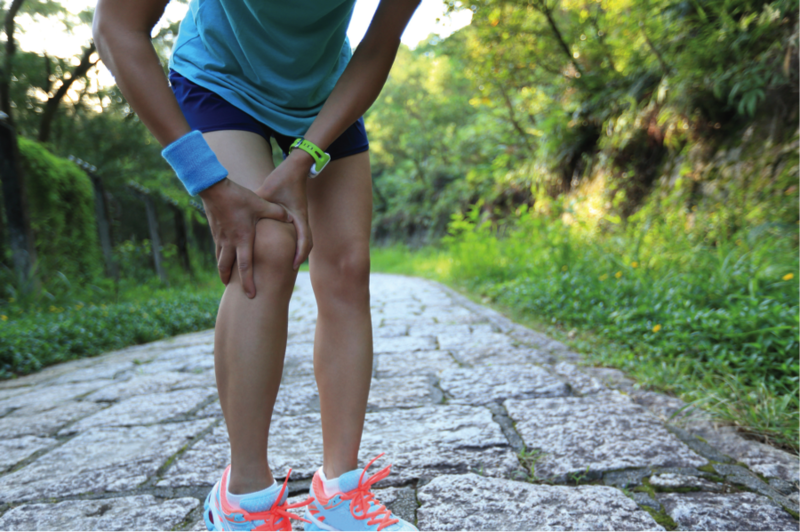 Joint issues are a common source of injury for female runners, says Bruce R. Wilk, a Miami-based physical therapist, running coach and author of The Running Injury Recovery Program. Women are naturally more flexible than men, he says. The downside is that when leg muscles become stiff, female runners can put too much pressure on loose ligaments, causing them to move beyond their normal range and potentially leading to knee and hip pain. To treat these types of joint injuries, Wilk will identify a runner’s tight spots in her muscles and work with her to stretch them. Adding strengthening exercises and deep-tissue massage also help to take pressure off joints that are being overloaded during tough runs. For example, Safran-Norton will help runners strengthen their hip and core muscles by teaching them clamshells, planks and wall slides as well as how to use resistance bands or weights. When it comes to a rubdown, Safran-Norton says therapists look for painful trigger points. Massage can feel uncomfortable while it’s being done, but any pain should go away within a day or two. Manual therapy should never hurt too much. In combination with manual therapy, a physical therapist will also sometimes use a machine that radiates electrical currents, known as electrical stimulation or e-stim, to target areas that are painful or swollen, Safran-Norton says. The currents are thought to block pain signals from the muscle to your brain, and, hopefully, make the area feel a lot better. Not just for OB-GYNs, this machine is often used by physical therapists to relieve pain. By emitting sound waves toward a painful, restricted or swollen area, the machine will stimulate your body’s cells to repair themselves and initiate the healing process, Safran-Norton says. A similar approach using ultraviolet light is starting to grow in popularity. Most injuries develop from runners going too far too soon, says Karen Litzy, a New York City–based physical therapist. “If you’re going to [train for] your first 5K, what you don’t want to do is run 4 miles at once. What you want to do is run a half-mile or do a combo run/walk, so you’re not jolting the tissues of the body too heavily,” she says. Another common cause of injury? “People who are only running, and not doing anything else, tend to have more injuries because strength training protects the joints,” she says. Litzy recommends doing at least one day a week of cross-training. Yoga is a two-for-one, because it incorporates both stretching and strengthening.